At the time of this article, the Donnelly Family of Lucan, Ontario had approximately twelve hours to live. It is said that James Donnelly Sr. made purchases the afternoon before his death on account, stating that the shopkeeper could “…charge them to the Queen, for he may well not be around to pay the debt himself in future.” – A chillingly accurate premonition to say the least. Shortly after midnight on February 4th, in the deeply religious lands of Biddulph Township, four Donnellys including a cousin visiting from Ireland, were brutally bludgeoned at the hands of their fellow parishioners. The victims were laid out to burn in a crude cremation of sorts, as their home was torched in an effort to destroy any evidence of the crime. The fifth and final murder of that fateful night came from gunshot wounds inflicted at point-blank range, which tore the torso of John Donnelly like a machete through paper-mâché. Thankfully, a young boy named Johnny O’Connor escaped the massacre at the Donnelly Homestead and lived to tell the tale in court, while John’s brother Will and others witnessed his assassination from only yards away. Interestingly enough, not a single conviction was made in the capital murder trial, and the entire travesty has become the stuff of legend. Often mistaken, always controversial and rarely fully understood. As a primary benefactor and honoured sponsor of The Lucan Area Heritage & Donnelly Museum, scheduled to celebrate its grand opening in May; I fully appreciate the cultural significance of this crucial facet of our past. 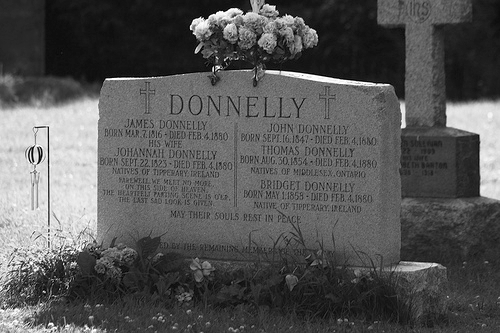 It is my sincere hope that through continued education and understanding, the lingering memories of the Donnelly Family and their raucous times in 19th century Ontario will serve to proliferate a concussion which blasts through our collective psyche with as much fervor as it did during their lives.